Take advantage of our extremely comfortable beds and relax while saving money year-round with our Kids Stay Free Policy (10 and under in parent's room). For those guests that are in town on longer term corporate assignments or business trips we also offer special weekly and monthly rates, as well as direct billing options. We are a 100 percent smoke free property. Sorry no pets are allowed. We are located one mile north of US-17 West, and are near to local attractions such as University of North Carolina Wilmington, Jungle Rapids Family Fun Park, and Cape Fear Community College. 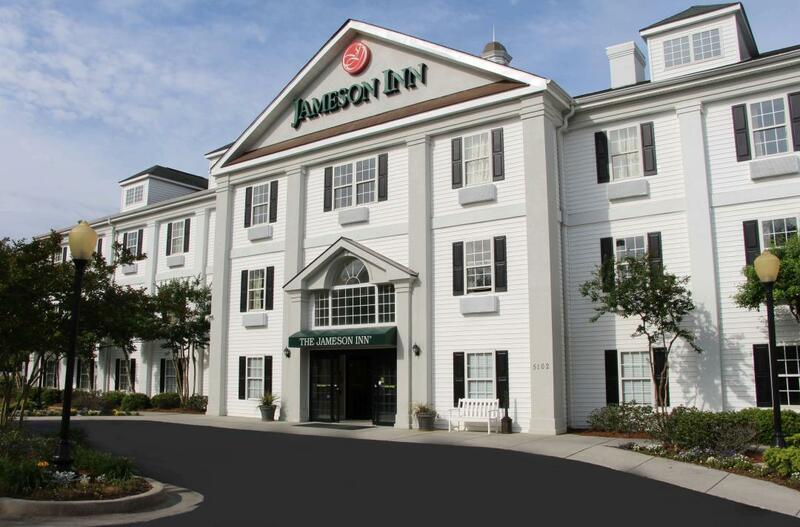 Jameson Inns Wilmington is your best choice within The Port City. We offer ideal accommodations and location whether you are in town for vacation, business, or simply passing through on your way to Raleigh or Atlanta. Genki Japanese and Sushi Restaurant, 0.1 mi. Incredible Gourmet Pizza, 0.2 mi. Kickback Jack's Restaurant, 1.7 mi. Prima Day Spa, 0.1 mi. Break Time Billiards Sports, 1.4 mi. Ten Pin Alley, 1.5 mi. BullZeye Shooting Sports, 1.8 mi. Seahawk Village Pool, 2.4 mi. Althea Gibson Tennis Complex, 3.2 mi. Wilmington Municipal Golf Course, 3.5 mi. Regal Mayfaire Stadium 16, 3.9 mi. Mayfaire Town Center, 4.4 mi. Red Barn Studio Theatre, 5.2 mi. Wilmington Athletic Club, 5.6 mi. Castle Hayne Park, 8.6 mi. Carolina Beach Jungle Mini Golf, 14.9 mi. Jungle Rapids Family Fun Park, 4.2 mi. Bellamy Mansion Museum, 5.8 mi. Cameron Art Museum, 5.8 mi. Battleship North Carolina, 6.7 mi. Tregembo Animal Park, 8.7 mi. Carolina Beach State Park, 15.3 mi. Fort Fisher Historic Museum, 20.3 mi. Fort Fisher State Recreation Area, 21 mi. North Carolina Aquarium At Fort Fisher, 21.3 mi. Brunswick Town State Historic Site, 23.7 mi. Premium guest room with 1 King Bed. Non-Smoking. Amenities include free wireless high-speed Internet access, microwave, mini-fridge, coffeemaker, hairdryer, 42-inch flat panel satellite TV, ESPN, Showtime, iron, ironing board, desk with lamp, alarm clock radio, free local calls, and wake-up service. Free deluxe continental breakfast is included.